Perform an amazing Zero Gravity flight! April Zero-G flights — group admission started! The next combined group zero-g flights is scheduled for April 25 and 26, 2019. Great impressions and unforgettable experience guaranteed! All of us at least once in our lives have dreamt of flying. We have no wings as birds have, but nowadays wings are not necessary anymore for people to fly. It becomes possible with the help of zero-g conditions. Let your dream come true! You have this chance if you perform a flight onboard the IL-76 MDK flying laboratory like cosmonauts do during their space flight training. 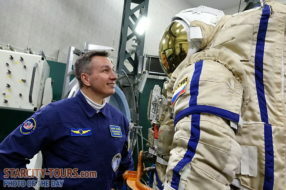 Weightlessness is one of the main specific features of the space flight that requires special organization of cosmonauts’ professional activity. Conditions of weightlessness simulated onboard the flying laboratory are very close to real space flight conditions and thus allow to work on the majority of operations in the periods of 25-30 seconds. Since 1967 to 1979 such flights were performed on flying laboratories Tu-104A. Since 1980 IL-76 MDK flying laboratories are used for such zero-g flights. The «IL-76 MDK» wide-body airplane is a unique flying laboratory, which can create short-term zero-gravity conditions. To achieve a short-term micro-gravity, the aircraft flies in a parabolic pattern that is called Kepler curve, rising to a height of about 20,000 feet, and then curving downward. People feel weightlessness in the upper point of parabola. It lasts from 22 to 28 seconds depending on flight accomplishment conditions and can be recreated up to 15 times within one flight. The Zero-G flight lasts 1,5 hours. Total time of your stay in zero-G conditions can be approximately 450 seconds. 13:45 – Arrival at Star city. 14:00 – Gagarin Cosmonaut Training Center tour. 15:00 – 16:00 – Medical examination. 16:00 – 17:00 – Acquaintance with the instructors. Instruction on safety arrangements and rules of behavior in case of off-nominal situations. 07:45 – Arrival at Star city. 08:00 – Transfer to Chkalovsky airbase. 08:30 – 09:30 – Preflight instruction aboard Il-76 MDK. 09:30 – 10:00 – Take-off. 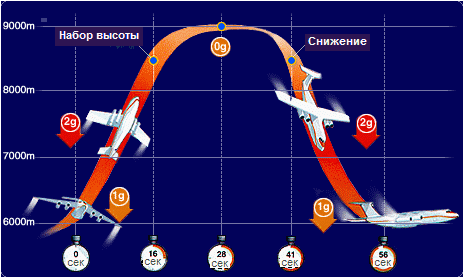 10:00 – 11:30 – Flight on IL-76 MDK flying laboratory with weightlessness into 10 parabolas. 11:30 – 12:00 – Personal certification. 12:00 – 12:30 – Transfer from the airbase to Star city. You should send in your medical certificate by fax or e-mail 5 days before the training. Before the training day you should arrive at GCTC for medical examination. You should send in your application at least 45 days before the flight with the passport data of all the participants enclosed. Only people of 18 years and older can take part in the training. You should be medically examined and certificated with a permit for training. Your medical certificate is a personal document and only doctors will have access to this information. Zero-g flight should be paid 21 days before the training date according to the agreement and invoice. After the instruction and medical examination you should sign the agreement on the release from responsibility.